Make some serious waves at beautiful Lake Murray in southern Oklahoma. The wooded foothills of the Arbuckle Mountains give way to the rolling blackjack prairie surrounding scenic Lake Murray, one of Oklahoma’s most popular outdoor destinations. Anchoring the state’s oldest and largest state park, this 5,728-surface acre lake offers plenty of opportunities for swimming, fishing and watersports in the heart of south-central Oklahoma’s Chickasaw Country. Featuring picturesque terrain, exceptional trails and one-of-a-kind historic sites, Lake Murray stands as one of the most serene and beloved natural areas in the state. You will definitely want to check out Tucker Tower on the southern edge of the lake. This 65-foot limestone tower was constructed by the Civilian Conservation Corps (CCC) as a summer retreat for former Oklahoma Governor William H. “Alfalfa Bill” Murray before being transformed into a geological museum and nature center. Today this gorgeous, iconic structure offers a stunning bird’s-eye view of the lake and surrounding landscape. Explore the tower after your day on the water, then grab a bite at the Blue Heron Restaurant located inside the newly-built Lake Murray Lodge, or make a quick drive to nearby Ardmore where you can chow down on a burger and enjoy an Oklahoma craft beer at the Red Dirt Brewhouse. Of course, Lake Murray is just one of the many places in the region where you can enjoy a day on the water. Check out our overview of other Chickasaw Country lakes and start planning your next getaway to beautiful south-central Oklahoma. Adventure awaits at Grand Lake O’ the Cherokees. 46,500 surface acres of water and 1,300 miles of shoreline make this northeastern Oklahoma gem a premier destination for anyone looking for lakeside fun. Grand Lake State Park is divided into eight discrete areas each with its own unique feel and attractions. Whether you’re looking to do some crappie fishing at the Bernice Area, enjoy the quiet solitude of the Spavinaw Area or take the Jet Ski out to the Snowdale Area, you’ll find a stretch of blue water with your name on it at Grand Lake. Venture into a nearby town like Grove and find one-of-a-kind treasures at the Antique Alley, one of the largest antique stores in the four-state region. Grab a bite at Clanton’s Café in Vinita, a favorite spot among locals. Learn about the history of the area at the Eastern Trails Museum, or check out unique roadside landmarks like the Will Rogers Archway and the quirky, Instagram-worthy Bart Simpson Tree located at the entrance of a Civil War battlefield. The region is also home to exciting music festivals like Rocklahoma in Pryor and the American Heritage Music Festival in Grove, if you want to add some live music to your trip. Whatever kind of fun you’re looking for, you’ll definitely want to come see what puts Grand Lake and its surrounding areas among the most popular destinations in the state. Grand Lake anchors the lake lover’s paradise of northeastern Oklahoma, but there are plenty of other incredible lakes worth a visit. Check out our list of some of the region’s top lakes, and start planning your Green Country getaway today. Ever been to a lake with an abandoned city beneath its waters? The once-thriving town of Lugert was deserted in the early 20th century after many structures were destroyed by a natural disaster. The area is now the site of Lake Altus-Lugert, a stunning oasis tucked away in the rocky plains of southwestern Oklahoma. Surrounded by the ancient granite formations on the western edge of the Wichita Mountains, the lake is located within the Quartz Mountain Nature Park, offering tremendous opportunities for boating, swimming, hiking and hunting. Book a room at the Quartz Mountain Resort, Arts & Conference Center, home to the prestigious Oklahoma Arts Institute held annually each summer and fall, and wake up to breathtaking lake and mountain views. Grab a bite at the resort’s Sundance Café during your stay, where you can enjoy a great meal while admiring world-class paintings from Oklahoma artists like Joe Andoe and Mike Larsen, or lounge outdoors on the CCC-style patio and take in the amazing scenery. If you’re looking to explore nearby, you can’t go wrong with a trip to Backdoor Steakhouse in Blair. This culinary institution might be known for its perfectly-prepared steaks, but the cedar plank salmon filet alone is well worth the trip. Lake Altus-Lugert is just the tip of the boulder when it comes to lakes in southwestern Oklahoma. See what other bodies of water are calling your name with our overview on the lakes of this amazing region. Whether you want to take a swim surrounded by rolling hills, reel in the big one among ancient mountains or pilot your watercraft around lush forested shoreline, there’s a lake for every taste in the Sooner State. Gorgeous, forested Broken Bow Lake stretches for 22 miles through some of Oklahoma’s most breathtaking terrain. The lake’s exceptionally clear water offers fantastic recreation opportunities like boating, fishing and even scuba diving. The area is one of the best year-round fishing spots in the state, giving you a chance to reel in varieties of bass, crappie, catfish and various species of sunfish. Whether you go for the fishing, the swimming or the scenery, this gem in southeastern Oklahoma is sure to become your new favorite lake getaway. Get some quality time on the water, but be sure to explore your surroundings at Beavers Bend State Park. This mountainous, pine-covered playground is one of Oklahoma’s most popular parks, offering adventure, jaw-dropping views and some of the best hiking trails in the region. Head into nearby Hochatown after a day in nature and re-fuel with a bite from Grateful Head Pizza Oven & Taproom. Enjoy after-dinner drinks at Beavers Bend Brewery & Taproom or Girls Gone Wine during your trip to this spectacular part of the state. Ready to see what else this amazing region has to offer? We’ve rounded up some of the most stunning lakes in Choctaw country, making it easier to plan your next getaway to scenic southeastern Oklahoma. Explore 17,000 surface acres of water and 168 miles of shoreline at Kaw Lake in Ponca City. Featuring nearly 300 RV campsites, along with showers, group shelters and picnic areas, this lake is a popular spot for groups and families looking for a relaxing outdoor getaway. Dive in at the swim beach, or hit the water from one of the two full-service marinas and see what makes Kaw Lake such a major draw for lake enthusiasts. The area is also a great place for anglers to reel in crappie, sand bass, walleye and more. Whatever lakeside fun means to you, you’ll find it at Kaw Lake. Be sure to head into town after your lake adventure and see what Ponca City has to offer. Stop by the Poncan Theatre, one of Oklahoma’s most impressive historic movie theaters, where you’ll be transported to an elegant Italian villa through the building’s “atmospheric” architectural design. Drop by for a guided tour, a movie or a concert before checking out other local attractions like the Pioneer Woman Museum and Standing Bear Park. If all the sightseeing has worked up your appetite, pull into the iconic Dixie Dog Drive-In for classics like burgers, milkshakes and the drive-in’s flagship “Dixie Dog,” a sweeter take on a traditional corn meal corn dog. You’re sure to find plenty of great ways to complete your trip to Kaw Lake in Ponca City. Kaw Lake is the gateway to the awe-inspiring expanse of Red Carpet Country in northwestern Oklahoma. Water may not be the star of the show in this part of the world, but you’ll still find a number of incredible lakes—including the state’s only saltwater lake—offering loads of fun and relief from the heat of the high plains. Looking to hit the water in central Oklahoma? Check out Lake Thunderbird. This scenic jewel sits just east of the vibrant college town of Norman and offers plenty of opportunities for outdoor recreation. 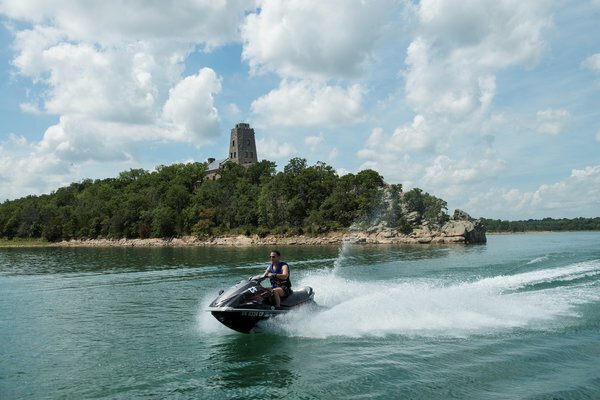 Featuring two marinas, nine boat ramps and two swim beaches, a day at Lake Thunderbird is the perfect way to beat the summer heat in central Oklahoma’s Frontier Country. The lake is the centerpiece of Lake Thunderbird State Park, featuring more than 200 RV sites, along with restroom facilities and primitive campsites for those looking to get closer to nature. A trip to Lake Thunderbird is a great opportunity to check out everything Norman has to offer. If a day on the water has worked up your appetite, come grab a bite at Midway Grocery & Deli. Perk up with a specialty drink from Gray Owl Coffee before you explore the bars and boutiques on Campus Corner, or come discover something amazing—like the world’s largest Apatosaurus and a whole crew of other dinosaur skeletons—at the Sam Noble Museum of Natural History. Stroll through the beautiful campus of the University of Oklahoma, or just do some window shopping on the historic downtown strip during your Lake Thunderbird adventure. Central Oklahoma is home to many other lakes uniquely connected to their urban surroundings. We have compiled a list of some of the region’s most noteworthy lakes to help in the planning of your next Frontier Country adventure.